Google’s suite of social tools, referred to as Google+, continues to kick out new features for all of its services. Last year we launched Hangouts with extras as a way to preview certain hangout features. (http://goo.gl/yXhB1) Google Docs integration was one such extra, and the Google+ community has used it for all sorts of awesome — from trip planning and lecture notes to doodling and charades. 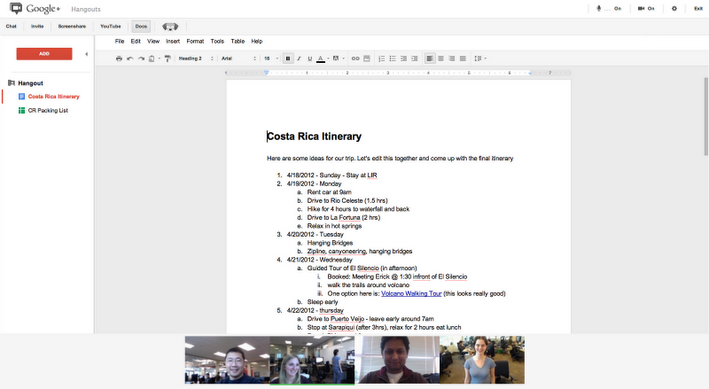 Today I’m happy to announce that we’re graduating Google Docs to the core Hangouts experience for all users. The features available for Google+ Hangouts make working with those who are scattered around the globe simple, and Google Docs integration is the perfect addition to go along with screensharing. Being able to go back and forth within a work document while carrying on a video conversation is a huge step forward for digital workplaces.